(2012.201.B1166.0554, Oklahoma Publishing Company Photography Collection, OHS). SHEETS, NANNINE JANE QUICK (1885–1976). Artist, teacher, and museum director Nannine Jane "Nan" Quick Sheets was born December 9, 1885 (some sources say 1889), in Albany, Illinois. In 1905 she graduated from Indiana's Valparaiso College School of Pharmacy. Five years later she married a classmate, physician Fred C. Sheets. Living briefly in Bartlesville and Muskogee, the couple moved to Oklahoma City in 1916. In 1919 she began summer classes with John F. Carlson, N. A., at the Broadmoor Academy of Fine Arts in Colorado Springs, Colorado. Additional instructors that Sheets credited included Robert Reid, Everett Warner, and Birger Sandzen. An excellent student, she earned scholarships as well as the school's special prize in landscape. Nan Sheets dubbed her Oklahoma City house "The Elms" and turned it into a salon for local and visiting artists. Each summer she traveled, studied, and painted and upon her return offered her summer's works for sale. With growing frequency she exhibited at regional museums, including the Dallas Museum of Art, the Witte Museum in San Antonio, and the Fort Worth Art Museum. In 1923 she was included in the annual publication Who's Who in American Art, the first Oklahoma artist so honored. During that summer she was invited to membership in the prestigious National Association of Women Painters and Sculptors of New York, considered at the time to be the greatest honor ever bestowed on an Oklahoma artist. From 1932 to 1962 she wrote articles for the Daily Oklahoman (Oklahoma City) newspaper about the art scene at home and abroad, adding direct, first-person experience to her increasingly effective criticisms. She also wrote an art column for The Oklahoma Woman magazine. 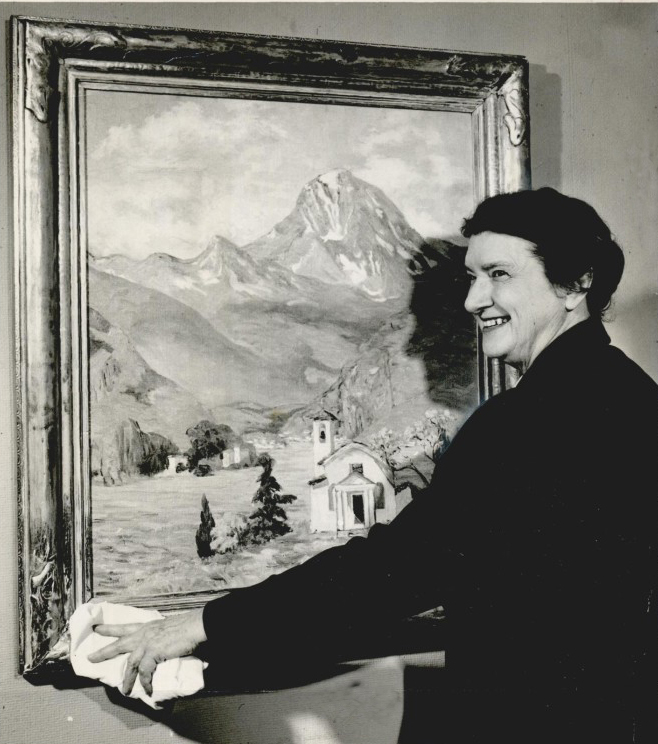 Increasingly in the public eye and in demand as lecturer, juror, and judge across the country, she was invited to co-manage Oklahoma's earliest New Deal project, and eighteen months later she became director of the Works Progress Administration's Oklahoma art presence, initially named the WPA Experimental Art Gallery and later the WPA Oklahoma Art Center. She was one of the few women selected as state directors. In 1940 works by Sheets were exhibited at the 1939–40 New York World's Fair. Her paintings were also included in each of the national art exhibitions arranged by the New York City Municipal Art Committee at Rockefeller Center. When World War II ended federal involvement in art centers, Nan Sheets and other art supporters infused the Oklahoma City center with new life as a museum. For the rest of her career she was closely aligned with the growth of the Oklahoma Art Center. During its early years she was the only paid staff member. A dynamic curator, she sought out and mounted as many as thirty or more exhibits per year. Today, she is less well known for an important career as an artist, mentor of artists, scholar, and effective teacher. Tall, quiet, kind, inclusive, this remarkable woman was a consummate listener, a convincing speaker, and a successful manager. During her tenure in Oklahoma City she witnessed and effected great changes, bringing them about as a result of personal drive, vision, and energy. Nan Sheets retired as director of the Oklahoma Art Center in 1965. She died in September 1976. "Nan Sheets," Oklahoma Art League Vertical Files, Archives, Oklahoma City Museum of Art. Charlotte Streifer Rubenstein, American Women Artists from Early Indian Times to the Present (Boston: G. K. Hall & Co., 1982). Marcia Shottenkirk, "Art Director's Influence Continues," Daily Oklahoman (Oklahoma City), 29 July 2001. O. North Tower, "Nan Sheets—Oklahoma City's Own Artist," The Oklahoma Woman 1 (August 1926). Jayne Hazleton Campbell, "Sheets, Nannine Jane Quick," The Encyclopedia of Oklahoma History and Culture, https://www.okhistory.org/publications/enc/entry.php?entry=SH021.